was born in Leiden, grew up near Zutphen (Eastern part of the Netherlands) and studied at the Utrecht Conservatory, where she gained her solo diploma. She took masterclasses in Budapest (Bartók Seminar), Darmstadt (Aloys Kontarsky) and Nice (Pierre Sancan) and studied electronic music with Ton Bruynèl. Her tutors were Ria Groot, Ton Hartsuiker and Geoffrey Madge in Holland and Stephen Savage and Martino Tirimo in London, and Luli Oswald, Brazilian piano virtuoso and daughter of Arthur Rubinstein. She frequently performs at home and abroad both as soloist and with ensembles, often playing first performances of new works, and works written for her. She lived in London for several years, performing throughout the UK, and made her debut at the Purcell Room. As well as touring the Netherlands, Monique Copper plays in several countries an Europe, South America, Asia (India in 2001) and the USA. 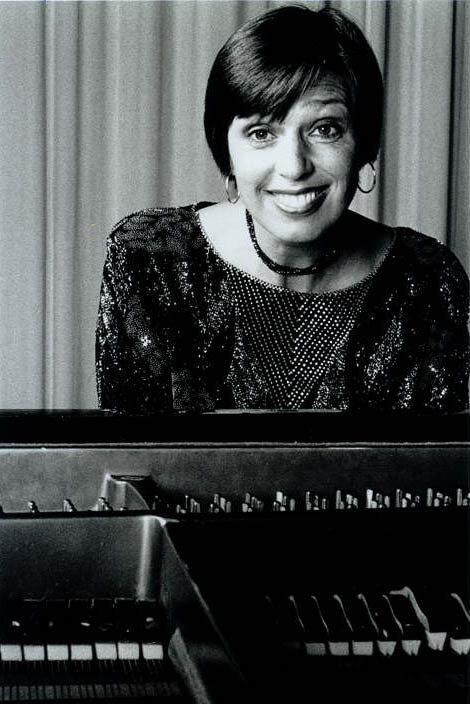 Monique Copper was one of the founders of the Delta Ensemble, was a member of the ASKO Ensemble and the Orgella Quartet and co-producer of the music theatre series Ridotto in Amsterdam. One of her specialities is lecture recitals of contemprorary piano music, acquainting her audience with contemporary music in general and with Dutch compositions in particular. Monique has also developed the Illustrated Recital - perhaps better described as a ‘one-woman multimedia show’ -, featuring simultaneous narration, slides and piano. Inspired by successful performances at home and abroad with productions such as Francis Poulenc’s Babar, and Claude Debussy’s Boîte à joujoux, Monique has collaborated with artists, writers and composers to create new programmes, performed in Dutch, English, French or German. A Pianorecital with poetic Comments in a touch of theatre. Poetry by: Aloys Bertrand, Emily Dickinson, Ogden Nash, Adriaan Roland Host, Jan Willem Otten, Carla Bogaards. In this International programme Dutch pianist Monique Copper pays a tribute to her own country, the Netherlands, which is so 'full of water'. She shares with you the feelings and experiences water can evoke, from Waves and Barcarolles to Ondines and other Myths. The Barcarolles evoke the feelings one can have with boat travels on rivers but also on ferocious seas. In the Ondines we hear the unexpected and the unpredictable of the water and also its extreme attractivity by way of the legendary waternymphs. Monique Copper is famous for her innovative programmes with art and literature. The poetry in this programme is by Dutch poets and poets from other countries. This unites the programme to a complete story. We know Monique from her first visit in 2001 when she made her first successful concert tour to five Indian cities and performed for us her "Portrait of a Friendship", a multidisciplinary recital with music by Mussorgsky, art by Kandinsky and poetry by Dutchman Willem Wilmink. Monique is still performing in many countries with the poetry narrated by her in English, French, Dutch or German. Monique Copper lives and works in Amsterdam, performing recitals in her own country and all over the world. "This waterprogramme, is the mirror of my being, of the feelings I have by living in a country with water omnipresent. The choice of the 'water' theme also originated by my discovery how many wind-, water- and snowbased compositions are represented in my repertoire, built up since my youth. I decided to compose a programme consisting of just 'waterworks' and take the opportunity to present an 'image' of my apparently deep love for the surroundings where I grew up, live and work. The Netherlands borders the North Sea and the land is crisscrossed by rivers, lakes, canals and polderditches. All these waterways make the aerial view of our country look like patchwork, the water being the stitching. Our cities are famous for their canals, like Venice. During the 17th Century, our "Golden Age", the open sea was very inviting so we started navigating the oceans and the trading of exotic spices began. This trade created rich merchants. They were the catalysts for a booming cultural life. They commissioned famous painters like Rembrandt van Rhijn and also marine painters like Ludolf Bakhuizen, who is my very own ancestor. I am not a painter, I am a pianist expressing in my own way my love for the water. I am expressing my feelings with classical pianoworks and works by contemporary composers with whom I discussed this subject of water and music. These composers were enthusiastic. The result is four new compositions that I premiered. WATER can be poetic, soothing, threatening and dangerous. I want to share with you my choices of music, poetry and art about WATER".